Cage farming costs less than the traditional method of purchasing and dumping large rocks on an oyster lease, spreading some seed and hoping for the best. 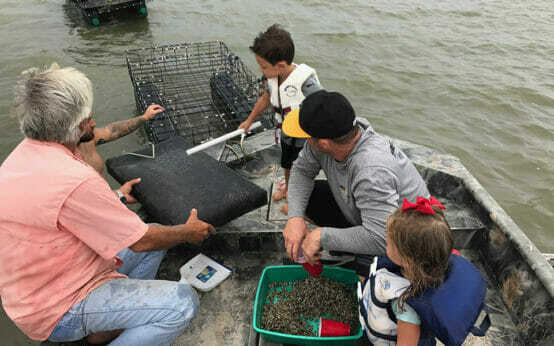 During times when traditional farmers can be found working their soil, Brandi Shelley and her father and brothers are out on the water on Bayou Hertesa, near Port Sulphur, Louisiana, tending to dripping wet cages full of growing oysters. But Shelley is happy to report that Shelley Farms stays relatively busy all the time because the cage technology allows them to harvest oysters all year round. Fans of the Gulf’s seafood are familiar with the warning “Eat raw oysters only in months that contain an R!” As Shelley explains, “That’s because during the summer, wild oysters spawn and, when they spawn, they shrivel up and get milky.” Cage-farmed oysters, on the other hand, begin as triploid seeds. “Triploid oysters are genetically designed to not breed,” says Shelley, “so they retain a nice size, shape and texture all year round.” Cage farming also costs less than the traditional method of purchasing and dumping large rocks on an oyster lease, spreading some seed and hoping for the best. Following an initial permit process that lasted almost three years, Shelley and her family began buying two-millimeter-long triploid seeds in sacks of 5,000. Traditional oyster farming involves laying tons of big rocks down in a leased plot of water and then spreading seed on those rocks and hoping for the best. Oyster larvae generally face predators and other challenges, so most never make it to a restaurant. Protected in cages, almost all of Shelley’s oysters peacefully mature in eight to 10 months. “Whenever we have an order, we’re able to just go out and harvest it,” she says. Oysters are now cage grown all over the United States. Louisiana State University even runs a giant lab dedicated to growing triploids for its oyster farms in Grand Isle’s Caminada Bay. As such, plenty of companies now make the gear. The Shelleys use the OysterGro system’s thick, rubber-coated metal cages. Instead of a tractor, the family steers a boat equipped with winches to haul up cages that grow heavier by the week.